An Anthropologist with a PhD in Marketing who works in research and development of the human-centered technology. A Europhile who believes in changing the world by changing the mindset of people, one person at a time. Studied management in Carinthia, and currently working in the management of a video marketing company. She loves to contribute to a positive interregional development in the Alpine-Adriatic Region. Engineer, but a humanist one. Specialized in World Heritage Management, specializing in Local Development. A curious, decent cook in love with nature and politics. Political Scientist, Transatlantic Relations Specialist. Avid Huxley reader and political debate enthusiast. French philosophy is her favourite pass-time. Welcome! This is our dedicated Team. Did we say that we would love to work with you? Don’t be shy and get in touch with us! Obsessed with learning and teaching different languages and an expert on Mexican swear words. When abroad, she realizes what it means to live in a peaceful Europe, thus “works” as an EU-ambassador. 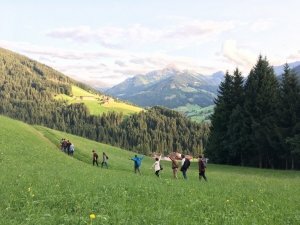 When (finally) home, she enjoys the Carinthian way of life including folk dance, Kärtner Käsnudl and traditional music. A passionate European, who moved after several years in Dublin Tech Scene to beautiful Munich. Currently helping companies with their digital transformation strategies in Online Marketing at a global scale. Focused, among other things, on challenging socio-political questions and having an impact on our region. A linguist, who loves languages because they allow communication among different people. A journalist, who loves writing - especially the kind of articles that give a voice to the ones who have none. A European, who appreciates and really believes in the power of a united Europe. Amateur cyclist just to save on public transport. Enjoying stand up comedy, film noir, porter beers and technology. Skeptical about ironing clothes. Every day thanking mankind for inventing yogurt. As musician and civil engineer, Elias loves to be engaged in interdisciplinary actions. Besides music, he loves to learn from and empower others and is therefore a member of various clubs. For him it´s all about communication and building a sustainable future. 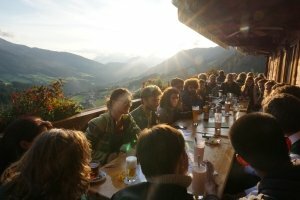 The Club Alpbach Senza Confini (CASC) is a cross-border non-profit organization that grants scholarships for the annual European Forum Alpbach. It was founded in 2003 to give motivated and talented young people from Carinthia, Italiy and Slovenia the chance to get in touch with interesting people from all over Europe and beyond. All our members are working on a voluntary basis to support the unification of Europe within our region. Especially in recent days, it is even more important to strengthen the peaceful relations and to raise awareness for political and societal issues in the European context. 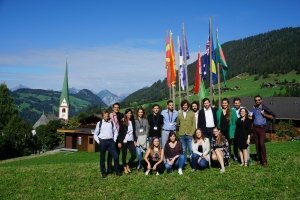 The Club was granted the official status as an associate member of the European Forum Alpbach (awarded by the former President of the European Forum Alpbach, Dr. Erhard Busek) and is thereby official provider of scholarships in the region. Promote the idea of for becoming “one” Europe among young Carinthian, Italian and Slovenian students and young academics. Providing our scholarship holders a significant competitive advantage by raising the awareness and acceptance for a joint European region. 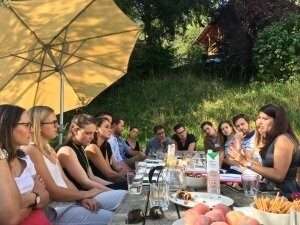 Promoting the idea of the European Forum Alpbach in cooperation with other existing Clubs throughout Austria, Italy and Slovenia. Organising open debate events for political and societal issues in a European context throughout the year in our region.